1. Deuteronomy--the name is Greek for Second Law, is a kind of farewell address from Moses to the Hebrew people, God's chosen people. 2. The main purpose of Moses' discourse is to remind the people of God's past faithfulness and to call them to respond to God's gracious deliverance of His people with faithfulness to God. Repeatedly, Moses reminds the people of how God freed them from slavery and how He protected them and even forgave them in the wilderness. 3. The Passover and Exodus, when God freed His people from death and slavery, are, taken together, the central event of the Old Testament. They are the defining moments of Old Testament faith. A similar event, one which we Christians see as the fulfillment of Old Testament law, prophecy, and history, plays a similarly defining role in New Testament faith. That event is the death and resurrection of Jesus. The result of the Passover and the Exodus in the Old Testament is that the people were freed from slavery in Egypt and they could develop their nation which, Martin Luther said, became the crib for the Savior of the world. The result of Jesus' exodus is that all who turn from sin (repent) and follow Him are freed forever from sin, death, and futility. 4. These verses of Deuteronomy are referred to by Jews as the Shema. The name is for the Hebrew word that comes at the beginning of the passage: Hear. 5. In the Shema, Moses tells the people to love God completely. Then, he urges the people to use all manner of methods to remember the faithfulness of God and their allegiance to Him. The bitter experiences of the wilderness, when the people often forgot God and chased after idols, would have given Moses plenty of motivation for underscoring the importance remembering God! 6. In verse 8, Moses says, "Bind them as a sign on your hand, fix them as an emblem on your forehead..." Many Jews have taken these words literally, wearing what are called phylacteries on their foreheads or their arms. [E]ither of two small, black, leather cubes containing a piece of parchment inscribed with verses 4–9 of Deut. 6, 13–21 of Deut. 11, and 1–16 of Ex. 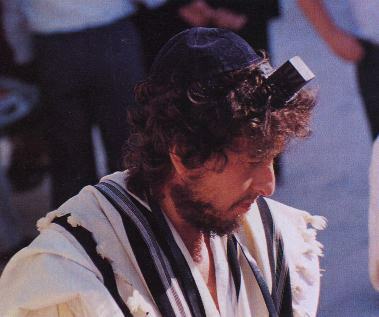 13: one is attached with straps to the left arm and the other to the forehead during weekday morning prayers by Orthodox and Conservative Jewish men. Phylacteries worn on the forehead are usually divided into four compartments, each containing parchments of a different Biblical passage. Those worn on the arm have one compartment containing a single parchment with the three passages mentioned above. It is unclear whether or not the Exodus and Deuteronomy texts were meant to be taken literally, since the commands about binding found in Proverbs 6:20-21 and 7:1-3 are not considered to be literal. Whether to be taken literally or figuratively, I think that the intent of Moses' command is clear. While Moses doesn't want the people to hide their faith (any more than Jesus minds it), the phylacteries aren't meant to be ostentatious shows of piety for the world. Rather, he's commending the phylacteries--literal or figurative--as means by which the Jewish people themselves would remember their God and His faithfulness. 7. In verse 9, Moses says: "...and write them [God's commands] on the doorposts of your house and on your gates." Most people walk through the doors of their homes each day, making the doorframe an ideal place for a regular reminder of God's faithfulness. Mezuzot, small containers made of wood or metal and containing passages of Scripture, are often used by faithful Jews today in response to Moses' words in the Shema. Today, many Christians choose to put a cross by their front doors, as much to remind themselves of what Christ has done for them on the cross as a witness for the world. 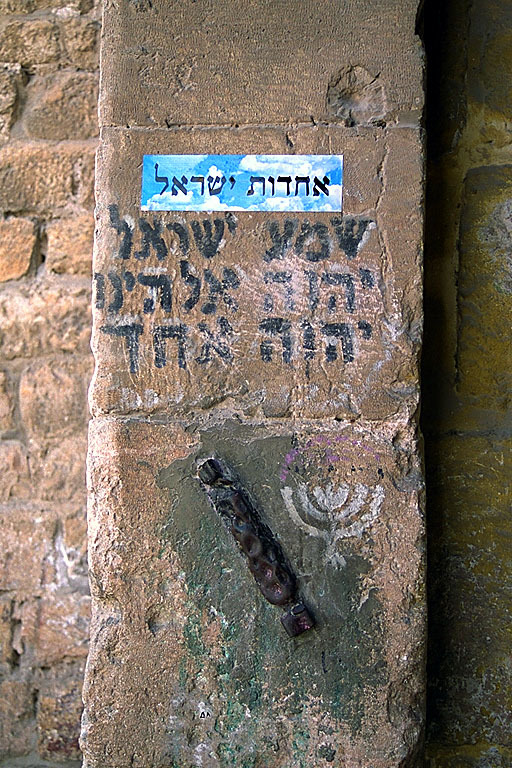 Below are images of a mezuzot (or mezuzah) in Israel; a collection of mezuzot from a catalog; and an interesting one that can be found on Main Street at Disneyland in California. from the jaunt my son, Phil, and I took to Columbus to go to Schmidt's and the Clippers baseball game at Cooper Stadium with my Dad on Monday night. Leaving Schmidt's in the German Village section of Columbus. Phil's video-ing from the backseat, I'm driving, and Dad is in the passenger seat. We start out turning onto Kossuth, then head south toward Schiller Park. I mention the story of a man named Mark Eisenmann, about whom I wrote in a short article for Columbus Monthly magazine back in the 1970s. I mention the story Eisenmann told me about the German youth killed during a parade in which he wore native German dress--which I later independently confirmed--here. Next, a brief and somewhat inaccurate history of Cooper Stadium, I gave to Phil on the parking lot. Inaccuracies, for sure: (1) The Clippers actually began play there in 1977, not 1978. (2) The Clippers will continue playing at The Coop through the end of the 2008 season. There may be more. Let me know if you find them. As usual, YouTube darkens videos and somewhat muffles the sound. Dad and I were telling Phil a bit about The Coop as we stood at field level, about a half-hour before game time. I had recalled how the stadium had remained dormant for the better part of a decade and we proceeded to tell him more about the place. Unbeknownst to me, Phil fired up the video function on his camera and prompted me to begin at the beginning. Cincinnati Red Ken Griffey, Jr. hit his 587th. career home run last night, a three-run shot against the Atlanta Braves. With it, Junior moved past one-time Red and later, Baltimore Oriole, Frank Robinson for career home runs. The official records show that Griffey is now sixth on the all time list. But we all know that he should be counted as fourth. At least 200 of the home run totals of both Barry Bonds and Sammy Sosa are highly suspicious, presumably juiced by steroid use. But no one has ever questioned the legitimacy of Griffey's home runs. Literally, every one of his career hits is legitimate. This summer, I could care less about the offensive output of Bonds. Or of Sosa, for that matter. To me, their numbers should always be shadowed by an asterisk, as in sinister and unreal. But I continue to be amazed by Ken Griffey, Jr. He has what may be the sweetest swing in the history of the game and a completely legitimate ticket to Cooperstown. My son, Philip, and I trekked up to Columbus yesterday afternoon, picked up my Dad, had a great dinner at Schmidt's Sausage Haus in German Village, and then headed to Cooper Stadium for a game between the Columbus Clippers, Triple A farm team for the Washington Nationals, and the Richmond Braves, part of Atlanta's farm system. For me, the trip was a sentimental journey. When I was a young boy, my family lived in the section of Columbus known as the Bottoms, on Thomas Avenue, just west of Central Avenue. Our house, which set across the street from the home of my Great Grandmother, was less than a half-mile from the ball park, then known as Jet Stadium, home of the Columbus Jets. Dad and I often walked to the Jets games. Later, after we moved to the Westgate section of Columbus--I was two months shy of my ninth birthday when we did that in 1962, we still went to ballgames. But we drove to them. Dad parked our car at Roger Wassmuth's Marathon station, a place he once worked, at the corner of Central and Mound Street. We then walked the block to the stadium. Going to see the Jets was always magical! Jet Stadium, as it was then called, was the first venue to which I went in which there were lights. Seeing them increase in brightness as the sky grew darker seemed almost miraculous to me, as though it was possible to banish the night and make the summer day last forever. I loved being able to hear pitched balls hit the leather of the catchers' mitts, as well as the cracks of bats making contact with the ball. My friends and I never were able to duplicate that latter sound, even when we swung our bats as hard as we could! I loved all that you could see on the field: dust on the legs and backsides of a base runner; the close plays at home. I loved the smell of the hot dogs and the sound of the concessionaires as they yelled, "Beeeeeer here. Ice cold beer here!" During evening games, I loved sitting in the gathering night, when the first wafts of the evening breeze carried the day's heat and humidity far away. I even loved it when rain delays came, forcing us to run for the shelter of the stadium's underbelly, with its concession stands and rest rooms, and then, sometime later, being able to emerge, part of a much smaller crowd, members of a small but lucky company who'd patiently waited for the resumption of the game. The play on the field at a minor league park is rarely of major league caliber. After all, these are players either on their way up to the majors...or ones who've been there and been sent back down...or ones who never will make it to the Bigs. But there's an intimacy and immediacy in a minor league park that compensates for whatever deficiencies may exist in the quality of play. It was in Columbus' minor league ballpark, as well as on the playgrounds of my youth, that I fell in love with baseball, a love affair that continues to this day! By the time I became aware of baseball as a little boy--around 1957, the Jets played in the stadium. At the end of each school year, through forms distributed by our elementary teachers, children could join the Junior Jets, entitling them to a large white badge with the blue logo of the team imprinted on it. When you wore the badge to a game, you got in for a reduced rate, something like fifty-cents. The Jets were affiliated with the Pittsburgh Pirates, owned by Mount Sterling-native and Columbus-area developer John Galbreath. The team gave up on Columbus in the early-seventies and for nearly a decade, the city had no minor league team. For me, a baseball fan with happy memories spent going to games with my Dad, it was sad to drive by Jet Stadium and see it becoming overgrown and seedier with each passing month. A myth developed that because "Columbus is a football town," there was no interest in baseball. I was convinced that Columbus could be interested in more than one sport...and that it was. The huge number of baseball and softball diamonds which dotted the city seemed to attest to that. The irony is that as Columbus' participation in the Triple A International League receded further into the past, the league's offices remained in Columbus, led by president Harold Cooper. In 1968, Cooper and Mike Dorrian, Democrats, were elected Franklin County Commissioners. In Ohio, each county is led by a three-member commission, which has both executive and legislative functions. Not long after Cooper and Dorrian were elected, they introduced a somewhat unique plan to bring baseball back to Columbus. In a nutshell, the county would acquire a franchise in the International League and play in the old Jet Stadium. In 1977, the Columbus Clippers, affiliated with the Pirates, began play in the newly renamed Franklin County Stadium. While the place looked a lot like it had in former days, changes were made. The press boxes were updated. Old wooden seats were replaced with new metal ones. An additional 3000 seats were added in a bleacher section that stretched next to the left field foul line. AstroTurf, then the rage, was installed. The old ballpark was, for the late-70s, a gorgeous and up-to-date venue. It was said at the time that only the New Orleans Super Dome, home field for the Zephyrs, was a better minor league park. In 1985, the stadium was rededicated as Cooper Stadium. It's always been a great place to watch a ballgame. Through the years, whenever I've taken friends who had previously only seen professional games at major league venues, their response has been enthusiastic. The experience is like a revelation to them. And for good reason! At the stadium now affectionately called 'The Coop,' you're right on top of the games. You can see every pitch and because your angle of vision is usually so good, you even have a legitimate bases for arguing with the umps' calls. In the early 80s, I took a buddy from seminary, an avid fan and a former high school star, to a game. He couldn't stop talking about how incredible it was being able to see everything that transpired on the field. When I was a kid sitting in Jet Stadium with my mitt at the ready, I had an excellent shot at snaring a foul ball lofted into the stands, something that you can little hope to do in most major league parks. Nowadays, I'm inclined to sit behind the netting that stretches from the stadium roof down to the rail behind homeplate to avoid foul balls. The holder of this ticket assumes all risk and danger incidental to the game of baseball, including specifically but not exclusively, the danger of being injured by wildly thrown and batted balls and agrees that the management is not liable for injuries resulting from such causes. I think that precise sentence has been on every ticket stub I've ever seen in Columbus. I never gave it too much thought until sometime in the 80s. A high school classmate of my wife's and mine had never been to a baseball game. "You ought to go at least once," I told her several times, urging her to take her little boy. Some months after I'd last lobbied her, she called us up. "I went to a Clippers game with Andy," she told me after I answered the phone. "Oh, that's great!" I enthused. "Did you have a good time?" "We did for awhile," she told me. "Well, a foul ball was hit toward us and I didn't really see it coming." "It hit me on the chin and knocked me flat on my back. They stopped the game for ten minutes, brought in the EMS, and carried me off on a stretcher. I got a standing ovation. They offered free tickets to me and couldn't have been nicer. But I don't think that I'll be going to another game." Cooper Stadium will, sometime late next year, be demolished. A countdown sign in left-center field announced last evening that there would be just 93 more Clippers games there. I suppose that, because of my inexplicable love affair with my hometown and my happy baseball memories, I could be wistful about that. But I believe in progress. The cramped seating of 'The Coop' no longer suits post-modern crowds, if for no other reason than that people, on average, are taller than they were back when the place opened up in 1932. (Like Wrigley Field, of which I once wrote here.) The new Huntington Stadium will probably be a great venue. Any forward-looking city will want to have professional baseball in its midst. It knits communities and families together, as it has mine over the generations. It can do that in new ballparks at least as easily as in old ones...and the good memories can stay with us for a long time. "...the top 100 blogs that I have found to be the most convicting, enlightening, frustrating, illuminating, maddening, stimulating, right-on and/or wrongheaded by Christians expressing a Christian worldview." Joe's comments underscore what I consider an important truth: It isn't necessary for us to always agree with one another, even we who consider ourselves followers of Jesus Christ. As someone once said, "If two people agree about everything, at least one of them is irrelevant." I don't always agree with Joe. But I always find him thoughful. That's true as well of blogs produced by those who are irreligious, atheist, political, apolitical, and so on. We all can learn from thoughful people. To be #28 on Joe's list is an honor. Thanks, Joe. The kind of blog written by a serious Christian that a serious atheist can completely embrace. I hope that comes across as a compliment. I am thoroughly complimented. Thank you very much! Psychologist Alan Loy McGinnis tells the story of a young pastor who began his years of ministry in a congregation in LA. The congregation was growing. But on the Church Council sat a man who was negative in his thinking and constantly throwing roadblocks to progress. The situation got so bad that the young pastor left that Los Angeles church and took a call to pastor a congregation in Kansas City. “But the week I arrived at my new church,” Pastor David Cowie said later, “I went to the [Church Council meeting] and there, sitting at the conference table, was the same guy...” Different name. Different face. But the same guy. Wherever we are in life, we’re likely to encounter troublesome people. They rub us the wrong way. Often, we’re at odds with them. And running away from them won’t help. As David Cowie’s experience demonstrates, no matter how far you run, you’ll always find new people who you find difficult. First and foremost, we need to maintain a strong relationship with God. Many of you know that often, when I meet couples contemplating marriage, I talk to them about the best strategy for insulating their marriage from division or divorce. So, I ask these young people why they think that their marriage will make it. They tell me that they love each other. I point out that in all my years of doing weddings, every couple has reported that they were in love. But not all of them made it. These couples will then tell me how open they are in talking with each other. Most couples contemplating marriage are. But even they divorce. Currently, you know, something like one of every two marriages ends in divorce. But that rate drops to something like one in sixty for those couples who worship together at least three times a month. And it plummets to one in six-hundred for those couples who worship regularly and who pray together regularly. I think that the explanation for these statistics is simple. The Bible teaches us that all of us are sinners who need to surrender our lives and wills to Jesus Christ so that God can reconstruct us from the inside us out. It also teaches that each and every one of us is so important in the eyes of God that we were worth Jesus’ death on the cross. People who have a strong relationship with Christ can be more charitable regarding the faults of others. We recognize that others are sinners just like us. But people who have a strong relationship with Christ also see the saintly potential in others. When, through Christ, we realize that God is our friend, it frees us to have a more friendly and accepting attitude toward others. Even toward those who drive us nuts. Second: Out of this attitude rooted in Christ, we need to try to understand the difficult people with whom we deal. In his book, And the Angels Were Silent, Max Lucado talks about the fateful night when Jesus was betrayed by Judas. Judas had been an apostle. The apostles--the term apostle means sent one--were a select group taken from Jesus' disciples. (Disciple, mathetes in the original Greek of the New Testament, means student or follower, which we're all called to be: students and followers of Christ.) The apostles were Jesus' inner circle of followers. Judas was part of that special group. The way to handle a person’s behavior...is to try to understand [them]...Jesus knew Judas had been seduced by a powerful foe. He was aware of the wiles of Satan’s whispers...[Jesus] knew how hard it was for Judas to do what was right...He didn’t justify what Judas did. He didn’t minimize the deed. Nor did he release Judas from [the consequences of] his choice. But He did look eye to eye with His betrayer and try to understand. When we view others with the eyes of Christ, we may encounter a betrayer--a Judas--or we may make a new friend. There are no guarantees. We need to also remember that people have the freedom to react to us just as they have the freedom to react variously to Jesus. But when we belong to a forever Savior and ask Him to help us to look at people through His eyes, we have the freedom to be charitable, the freedom to seek to really understand the difficult people life brings our ways. Of course, it’s easy to love those we find lovable. Jesus tells us today, “if you love those who love you, what reward do you have?” He goes on to say that even the tax collectors of first century Judea, extortionists who routinely hung out with other criminals and notorious sinners, knew to treat their own kind well. So did the Gentiles, non-Jews, Jesus said. But a really rewarding life, one filled with the grace and power of God, belongs to those who ask Christ to help them love all their neighbors as they love themselves. Each day, I ask God to help me to live like that! Some days I almost do. Fourth: We need to repent for any difficulties we may have introduced into our troubled relationships. This will always mean seeking God’s forgiveness. It may sometimes mean seeking forgiveness from the person we find difficult. Mark Twain once said that when he was fourteen, he thought that his father was the stupidest person on the planet. 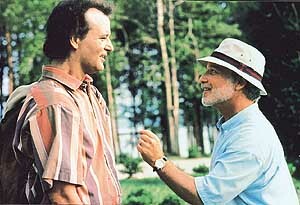 When Twain hit twenty-one, he said, he was astonished to find how much the old man had learned in seven years! The point is that often the people we see as difficult aren’t really difficult people. They’re people telling us things we’d rather not hear. Or, they’re people we misunderstand. Some of you know that early in my four-plus year seminary career, there was a professor I was sure didn’t like me. I thought he was a pain. I avoided him and when I couldn’t do so, I was surly and incommunicative. Then, my senior year, I had no choice but to take one of his classes. At the end of the quarter, he thanked me for doing so and asked if I would enroll in another of his seminar-style classes the following quarter, just to prompt and guide discussion among the underclassmen. At the end of that quarter, he thanked me again. I learned that this man I’d thought was a cold automaton was a warm, gracious, loving Christian, filled with charity for others and a great sense of humor in spite of many tragedies that had befallen him in life. I realized that I may have been the problem in our relationship. I repented, asking God’s forgiveness. Sometimes the people we find difficult really are difficult. You learn this mostly because when the person you find troubling comes up in conversations, others wince or complain about how difficult they are. If I die before I wake, I want to have done everything I can to restore relationships with even the difficult people in my life. How about you? If you agree with that praying boy, ask Christ to help you do just that.